Next town to record on the route is Bielsko-Biała. I know the town quite well. Some of my family lives here and some years ago I used to go to art school in Bielsko. I visit this town on regular basis and I thought, that it would be much easier to find sites to record in a familiar location but I have realized that I work much better in places where I had to discover locations during my journey. I think I am more sensitive and responsive to the acoustics of unfamiliar surrounding than places that I know well. Bielsko-Biała until 1951 was composed of two towns situated on opposite sides of Biała river: Bielsko which was part of Silesia and Biała part of the Małopolska region. Bielsko’s first settlement began in the 12th century and Biała started to develop in 16th Century. 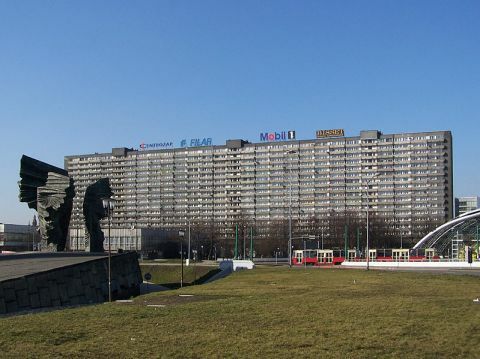 Today’s population of Bielsko- Biała is around 175,000 people. Before the World War II Bielsko was multinational; alongside Polish citizens there were German, Jewish and Czech nations, which is reflected in the architecture of the town. The textile industry brought wealth to the city in 19th Century. Bielsko was then part of Austro-Hungarian Empire. The factories owners strongly connected with Vienna looked to Viennese fashion for their inspiration commissioning new buildings in the town. 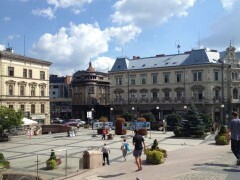 Although Bielsko is certainly not as grand as Vienna it has always been known locally as “Little Vienna”. The town is surrounded by beautiful mountains of Beskidy Range it is also a popular tourist destination. Visiting Bielsko reminded me of Simon Starling’s project Flaga (1972-2000)(2002). Starling drove 1290 km in a red Fiat from Turin (originaly where Fiat was produced), to Cieszyn (A Polish town on the border with Czech Republic) where he replaced the boot, bonnet, and doors for white parts produced at the Fiat Bielsko factory. 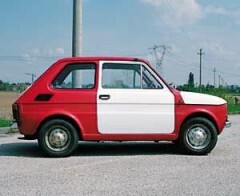 Italian 1973 Fiat 126 with the white inserts resemble Polish flag. The work questions national identity, and the role of borders Europe and globalization. As a child and teenager many times I had a pleasure to be a passenger in Fiat 126 and I think it is a massive commitment to art to take 1290 km (12h at list) journey in this vehicle. The hour for Bielsko-Biała on my clock is 10-11am. The train station in Bielsko is not as lively as some of the other stations I have recorded during my project. The station was built in 1890 (design by Karol Schulz) and it has been recently renovated. Bielsko was already connected in 1855 to Emperor Ferdinand Northern Railway – Kaiser Ferdinands-Nordbahn connecting the town with Ostrava, Brno and Vienna. The station main hall looks very attractive with ornate ceilings and walls. The high ceilings and stone floor give interesting reverb in the recording. On the wall there is an old-fashioned rotating timetable spinning every 10 minutes giving a great sound. I have noticed this board only in the Eastern part of Europe on my journey. Following day between 10-11 am I wondered around the town recording the market, various squares and conversations on the streets. Bielsko has beautiful neo renaissance Town Hall with a clock tower. For the first time on my journey I have recorded a Town Hall bell, which was produced by an electronic signal. Bielsko-Biała along with Trieste and Venice on the journey hasn’t got a tram network in the city centre. 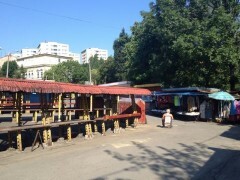 The only transport through the city are the buses and taxis.